A special thanks to John Hoerr for driving out to the Berean office just to help unload a skid of Bibles. We oldies so very much appreciate young men with muscles. 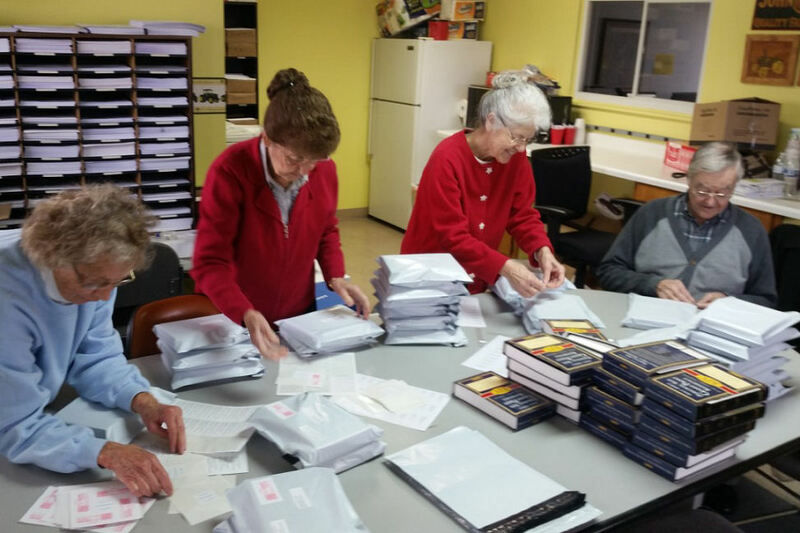 Today Anna, Edie, Roma and Chuck came to stuff, wrap, label and load Bibles. What would we do without willing workers? Thank you THANK YOU for all who helped this week. We really couldn't get the mail processed and the Bibles mailed without all your help. It was SO satisfying to have the first batch of the new Bibles on their way to prisons all over North America. What an amazing Christmas Gift this is, the Book of LIFE, the one with ALL the answers. This Bible is KJV giant print with color maps and words of Jesus in red. We at the Berean office can anticipate a huge response of many more requests once these are delivered.